I first discovered the bullet journal system in 2013 when Ryder Carroll first shared it. I stuck to it pretty rigidly and actually stopped using it until I rediscovered it in 2015. This time, the community had been established and people were making the system their own. With the freedom and being in a different time in my life, I dove in and began my own bullet journal experiment. And it was awesome. I went from using planning systems for 4 months at a time to using this system for almost 4 years. This system has been such a gift to me and countless others. As a leadership educator, I believe a system and process like this empowers people to see their way of organizing the world and their life as valid. That not everything has to be a color coded, minimalist, sparse aesthetic – that meaningfully organized could be colorful, spatial, spilling over, and so much more. That people could design the structure, rather than forcing themselves to fit into a given one. And now, Ryder has published a book about the system, The Bullet Journal Method, to share more of the story. To be honest, I was surprised too see how thick this book was! When I dove into it, I realized it’s because Ryder went all out in the stories AND research about why this system can be beneficial and why it resonates with so many people. As a reflective person myself, I found myself re-energized to do more goal setting and journaling… which does NOT happen often, I can tell you that! So anyway, it is about damn time I got this post up so I can GIVE AWAY a copy of the Bullet Journal Method AND an Official Bullet Journal Leuchtturm notebook. That’s all! This giveaway will be for US participants and you can enter until 11:59pm 10/25/2018. I’ll announce a winner on Instagram and you will have 24 hours to claim your prize. I like to include my writing word count tracker in my bullet journal. I include a tracker for the items I crochet each year in my bullet journal. I color a 2×2 square with the colors from each hat I create then write the number of the hat over the colors. It makes a page that resembles a colorful patchwork quilt and that makes me smile when I see how much I have accomplished toward that goal. I keep a running menu in my journal. I have a step tracker based on those popular, colorful mood trackers. My goal is to walk at least 3000 steps each day. Each month is represented by a turtle with different parts marked off as days. I’ve assigned colors to ranges of steps: anything below 3000 is gray, 3000-4000 is a Kelly green, 4000-5000 is an olive green, etc. Nowadays, it’s rare that I color in a part of the turtle gray. My most useful spread is my monthly log in my work bujo. I use it like a brain dump and refer back to it over and over again during the month to make sure I’m on target to reach my monthly goals. My favorite thing is my bill tracker. I enjoy planning out my bills even when they take up a vast majority of my income. I love my one word a day tracker the most right now! I added monthly habit trackers at the beginning of this year and they have immensely helped me build healthy, daily habits! @organizedchaos.kk, my money go list… Similar to a honey do list but it’s all the things that we want/need to do around our house hence where our money will go! As I’ve not started one yet, I think the habit tracker would be a fav of mine! My most loved/used spread is quickly becoming my exercise log. It helps me track my progress, especially on days when it feels like i’m not making at all. @heatherperdigon – My favorite collection is my Supernatural episodes, but my most useful collection is my and my husband’s medical timelines and medications – super helpful when we go to doctors visits. My Master To-Do is my most used list. It has every section of the house and what needs to be accomplished in each room; it is my on going project list. My most used tracker is the one that i use to track me and my son’s medication. I look at them every day to make sure we both get what we need. Definitely got be the brain dump called the to do list so that I can check things off as I go so I can see what I have accomplished but also to be conducive to a good night’s sleep since I wouldn’t have those items still stuck in my head on a mental to do list. That maybe and/or a gratitude list. My favorite list (that needs help the most) is my to do list for work! My current most useful bullet journal collection/list is my gym tracker which lives right next to a bigger habit tracker. This way I can see how my health goals interface with daily goals! 2. My favorite collections are my (a.)TBR! I get so excited about books and the different stories. (b.) Goals! I have major depression and other mental health problems. Having a goals list keeps me going at some level when things get tough. It gives me hope for my future. I can only hope to grow and get better by using my bullet journal. 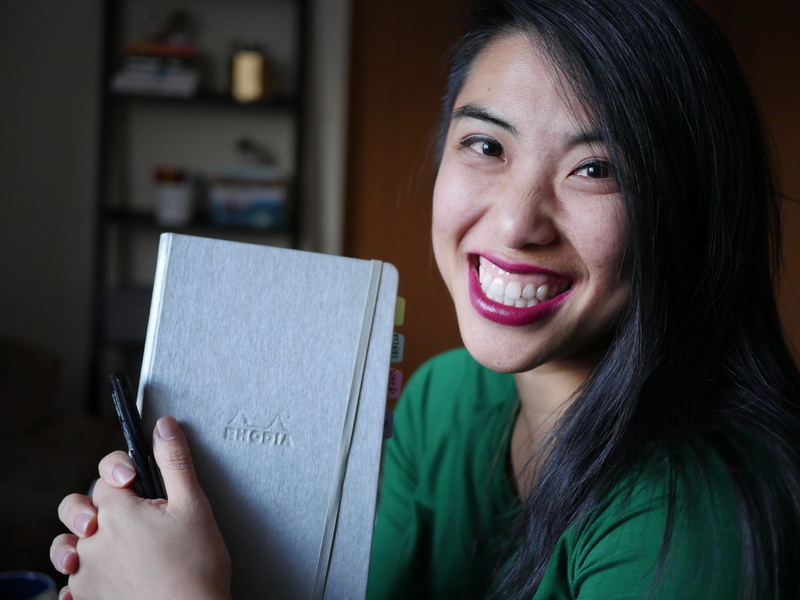 @jaynatuominen I’d use the journal to help make sure that I keep a promise to myself to have better work and life balance, tracking my progress throughout the week and to help remind myself to spend time doing more of what i love like yoga, weight lifting, and drawing. @blackwellcalligraphy I am going to start a habit tracker to make sure I’m writing in my gratitude journal at least five times a week and my spiritual journal daily. I’m really excited about it since I’m already sticking to it without the tracker. @sdrisc14 my favorite list is the list of pokemon I still have to catch or evolve in pokemon go. I am probably one of the few people still playing. I frequently refer to my “books to read” list and add books as a title interests me. Along the same line, my list of bullet journal related ideas are a favorite as I work to perfect the system for me. 2 – I love keeping my running to do list in my bujo and my monthly task list. My re-paradigming book list is my most useful. This old dog keeps trying to learn new tricks. I have been subscribed to your instagram and Ryder’s for ages. And to your youtube channels. I go by my regular name @tarihuffaker. Hoping to start a bullet journal and want to keep track of books I’ve read and my reactions to them. Lists of books to read! My most useful Collection so far has been a spread of ways I have been successful at my current job. Ways to encourage myself – I needed everything positive in one area. My most useful collections are the ones I use for planning conferences! I’ve tweeked the setup a bit and found it’s incredibly helpful in the months/weeks leading up to con season since I tend to be at 3-5 multiday cons in a 3.5m period. All my travel/accommodation information, classes/panels I’m teaching, performances I’m doing, and random details that I need to know quickly and easily. Usually my ongoing home improvement projects spread is most useful, since it is where I go to find things to do when I have a chunk of time. My daily+ (weekly/monthly) pages are most used. And I’m pretty excited for my travel planning pages! In a couple weeks, that will be most useful! I love that the system isn’t rigid and you can think about and answer these questions differently even weeks apart! I’ve been surprised that the layout I enjoy looking back on the most is my monthly gratitude log. I struggle with anxiety and depression, so finding something to be happy about every day can be a challenge – but looking back on happy memories, one month at a time, reminds me how full my life is. My most useful collection would have to be my meal planning collection where I have collected recipes from magazines and compiled them in my bullet journal. I Love my gratitude log. I’m planning a collection of favorite recipes that I can use as a guide for my meal planning and grocery shopping. This part of my life is always challenging, so I’m hoping this eases some stress. Right not I have lists in my planner because as much as I admire and want a Bujo I haven’t had the chance to start one. My most useful list right now is a productivity list of ideas of things I could be doing iwhen I’m having down time. Thank you for the chance!! Rolling to-do list and intermittent fasting tracker! I like making travel logs for my holiday plans with lots of small images. My favorite collection is my grocery list/meal page, it makes not only meal planning easy, but buying stuff for those meals super quick!